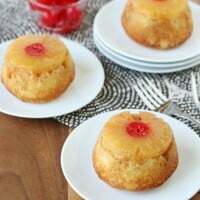 Need a pretty dessert to feed a crowd? 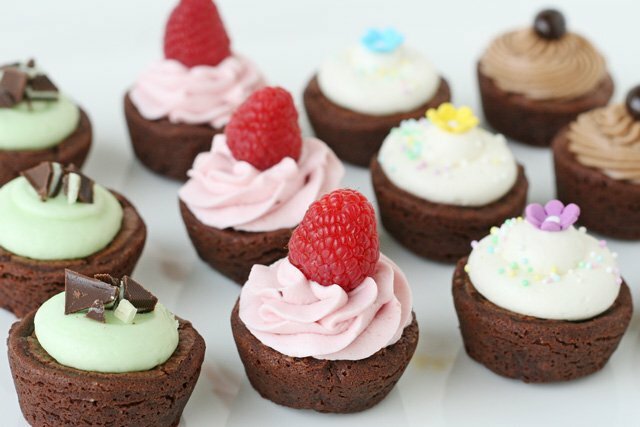 Impress your guests with delicious little brownie bites with homemade frosting! From time to time I am asked to make dessert for a large group…such a church or school event, or large party. Although I love making desserts totally from scratch, time is not always on my side! 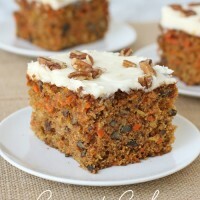 I like to have a few ideas up my sleeve that are pretty, delicious, and easy to make for large events. 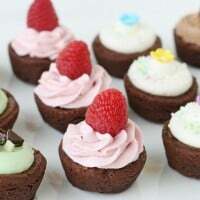 If you start with high quality, store bought brownie bites and dress them up with a selection of delicious homemade frostings, you can easily make dessert for a crowd! 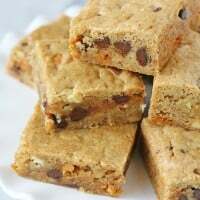 I used delicious brownies from Sugar Bowl Bakery, available at Costco and many local grocery stores. This delicious frosting can be used to dress up brownie bites, and is equally delicious on cupcakes and cakes. Add the cream cheese and beat until fully incorporated and smooth. While slowly blending, add 1-2 cups powdered sugar. Add liquid and flavoring ingredients based on your flavor choices below, and blend. Add remaining powdered sugar, and beat until all ingredients are well incorporated, and frosting is fluffy (20-30 seconds). 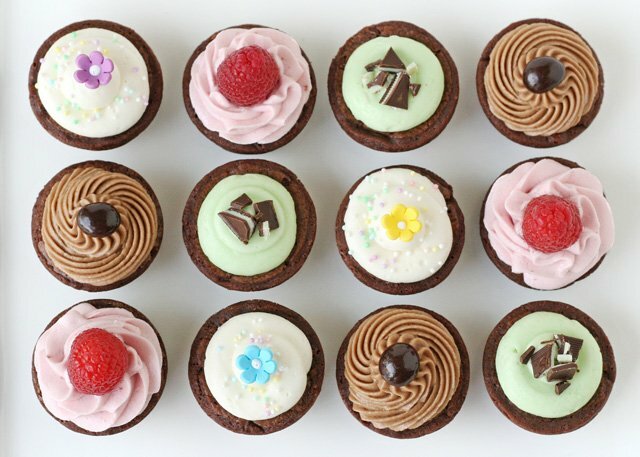 If you need to brush up on your piping skills, feel free to reference my post on How to Frost Cupcakes, which includes a quick video, and shows which piping tips produce which final look. 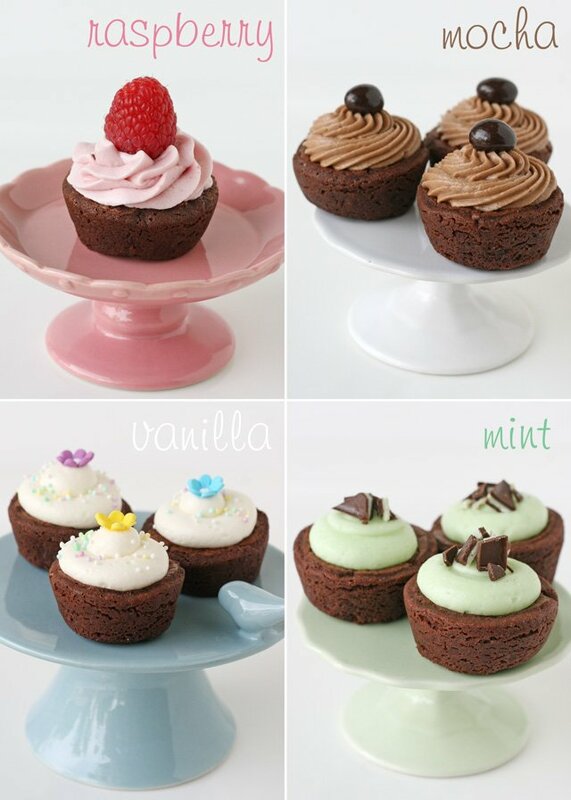 Which of these tasty little brownies would you chose first… raspberry, vanilla, mocha or mint? Disclosure – I was provided products from Sugar Bowl Bakery for dessert for my daughter’s school auction. I only work with companies I love and promote products I truly use. Nothing wrong with halfway homemade! Love this idea. I am totally going to do this. 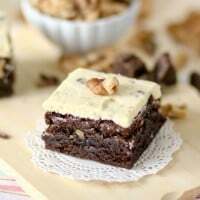 I have been to many events where those store bought brownie bites showed up, and truth be told, they look awful. What a great dress up you put on these humble treats! 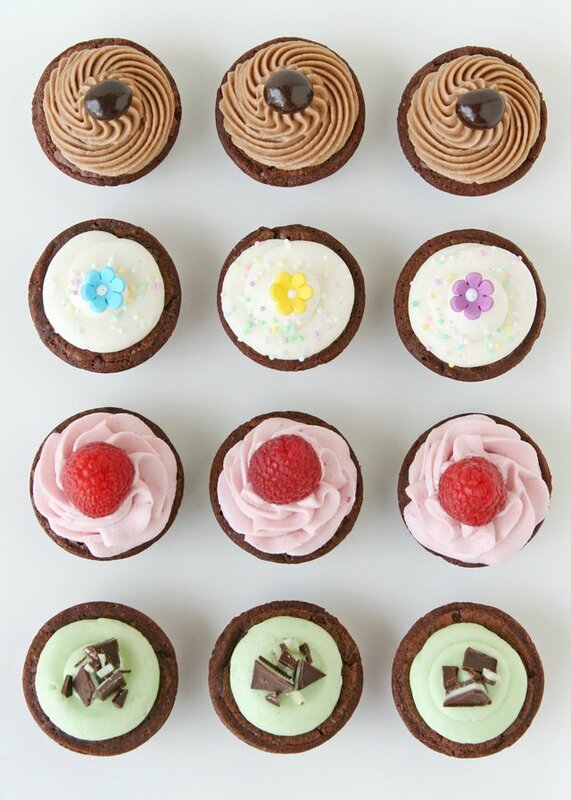 And way smaller and yummier than a cupcake! LOVE MINT!!! They are all so cute. Vanilla is my all time favorite. I’m a die hard brownie fan too. But haven’t had frosted brownies yet. Your brownie bites are so damn pretty. I’m going to try it. Thanks for this post Glory. Truly gorgeous! And so handy having a good buttercream recipe on hand – thank you! Oh, we have been doing this for years now! Different decorations for different seasons, my daughter frosts & takes them to school all the time for a treat! Yum! These look awesome and I bet they taste just as great! Thanks for the idea, my kids have bake sales x 3 each school year and sometimes more. This will help me out! Love you! Definitely saving this. I love how easy it is to switch up the flavor. Craving the raspberry right now! Havn’t tried it, but it looks delicious!